The teleprinter evolved through a series of inventions by a number of engineers, including Samuel Morse, Alexander Bain, Royal Earl House, David Edward Hughes, Emile Baudot, Donald Murray, Charles L. Krum, Edward Kleinschmidt and Frederick G. Creed. Teleprinters were invented in order to send and receive messages without the need for operators trained in the use of Morse code. A system of two teleprinters, with one operator trained to use a keyboard, replaced two trained Morse code operators. The teleprinter system improved message speed and delivery time, making it possible for messages to be flashed across a country with little manual intervention. There were a number of parallel developments on both sides of the Atlantic Ocean. In 1835 Samuel Morse devised a recording telegraph, and Morse code was born. Morse's instrument used a current to displace an electromagnet, which moved a marker, therefore recording the breaks in the current. Cooke & Wheatstone received a British patent covering telegraphy in 1837 and a second one in 1840 which described a type-printing telegraph with steel type fixed at the tips of petals of a rotating brass daisy-wheel, struck by an “electric hammer” to print Roman letters through carbon paper onto a moving paper tape. In 1841 Alexander Bain devised an electromagnetic printing telegraph machine. It used pulses of electricity created by rotating a dial over contact points to release and stop a type-wheel turned by weight-driven clockwork; a second clockwork mechanism rotated a drum covered with a sheet of paper and moved it slowly upwards so that the type-wheel printed its signals in a spiral. The critical issue was to have the sending and receiving elements working synchronously. Bain attempted to achieve this using centrifugal governors to closely regulate the speed of the clockwork. It was patented, along with other devices, on April 21, 1841. In 1916, Edward Kleinschmidt filed a patent application for a typebar page printer. In 1919, shortly after the Morkrum company obtained their patent for a start-stop synchronizing method for code telegraph systems, which made possible the practical teleprinter, Kleinschmidt filed an application titled "Method of and Apparatus for Operating Printing Telegraphs" which included an improved start-stop method. The basic start-stop procedure, however, is much older than the Kleinschmidt and Morkrum inventions. It was already proposed by D'Arlincourt in 1870. A teleprinter system was installed in the Federal Aviation Administration Flight Service Station Airway Radio Stations system in 1928, carrying administrative messages, flight information and weather reports. By 1938, the FAA's teleprinter network, handling weather traffic, extended over 20,000 miles, covering all 48 states except Maine, New Hampshire, and South Dakota. Exchange systems such as Telex and TWX. These created a real-time circuit between two machines, so that anything typed on one machine appeared at the other end immediately. US and UK systems had actual telephone dials, and prior to 1981 five U.S. area codes were reserved for teleprinter use; German systems did "dialing" via the keyboard. 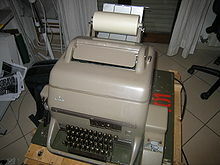 Typed "chat" was possible, but because billing was by connect time, it was common to prepare messages on paper tape and transmit them without pauses for typing. The U.S. navy 5-unit teleteypwriter (TTY) code used for automated radioteletypewriter (RATT) communications. This is the ITA2 version of the Baudot–Murray code. Most teleprinters used the 5-bit International Telegraph Alphabet No. 2 (ITA2). This limited the character set to 32 codes (25 = 32). One had to use a "FIGS" (for "figures") shift key to type numbers and special characters. Special versions of teleprinters had FIGS characters for specific applications, such as weather symbols for weather reports. Print quality was poor by modern standards. The ITA2 code was used asynchronously with start and stop bits: the asynchronous code design was intimately linked with the start-stop electro-mechanical design of teleprinters. (Early systems had used synchronous codes, but were hard to synchronize mechanically). Other codes, such as FIELDATA and Flexowriter, were introduced but never became as popular as ITA2. For example, a "60 speed" machine is geared at 45.5 baud (22.0 ms per bit), a "66 speed" machine is geared at 50.0 baud (20.0 ms per bit), a "75 speed" machine is geared at 56.9 baud (17.5 ms per bit), a "100 speed" machine is geared at 74.2 baud (13.5 ms per bit), and a "133 speed" machine is geared at 100.0 baud (10.0 ms per bit). 60 speed became the de facto standard for amateur radio RTTY operation because of the widespread availability of equipment at that speed and the U.S. Federal Communications Commission (FCC) restrictions to only 60 speed from 1953 to 1972. Telex, news agency wires and similar services commonly used 66 speed services. There was some migration to 75 and 100 speed as more reliable devices were introduced. However, the limitations of HF transmission such as excessive error rates due to multipath distortion and the nature of ionospheric propagation kept many users at 60 and 66 speed. Most audio recordings in existence today are of teleprinters operating at 60 words per minute, and mostly of the Teletype Model 15. Another measure of the speed of a teletypewriter was in total "operations per minute (OPM)". For example, 60 speed was usually 368 OPM, 66 speed was 404 OPM, 75 speed was 460 OPM, and 100 speed was 600 OPM. Western Union Telexes were usually set at 390 OPM, with 7.0 total bits instead of the customary 7.42 bits. Communication by radio, known as radioteletype or RTTY (pronounced ritty), was also common, especially among military users. Ships, command posts (mobile, stationary, and even airborne) and logistics units took advantage of the ability of operators to send reliable and accurate information with a minimum of training. Amateur radio operators continue to use this mode of communication today, though most use computer-interface sound generators, rather than legacy hardware teleprinter equipment. Numerous modes are in use within the "ham radio" community, from the original ITA2 format to more modern, faster modes, which include error-checking of characters. In 1931 Edward Kleinschmidt formed Kleinschmidt Labs to pursue a different type design of teleprinter. In 1944 Kleinschmidt demonstrated their lightweight unit to the Signal Corps and in 1949 their design was adopted for the Army's portable needs. In 1956, Kleinschmidt Labs merged with Smith-Corona, which then merged with the Marchant Calculating Machine Co., forming the SCM Corporation. By 1979, the Kleinschmidt division was branching off into Electronic Data Interchange, a business in which they became very successful, and replaced the mechanical products, including teleprinters. 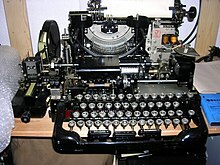 In addition to the 5-bit Baudot code and the much later seven-bit ASCII code, there was a six-bit code known as the Teletypesetter code (TTS) used by news wire services. It was first demonstrated in 1928 and began to see widespread use in the 1950s. Through the use of "shift in" and "shift out" codes, this six-bit code could represent a full set of upper and lower case characters, digits, symbols commonly used in newspapers, and typesetting instructions such as "flush left" or "center", and even "auxiliary font", to switch to italics or bold type, and back to roman ("upper rail"). The TTS produces aligned text, taking into consideration character widths and column width, or line length. As a result, by the mid-1990s, amateur use of actual teleprinters had waned, though a core of "purists" still operate on equipment originally manufactured in the 1940s, 1950s, 1960s and 1970s. ^ "Type used for original morse telegraph, 1835". Science Museum. Retrieved December 5, 2017. Samuel Morse was one of the pioneers of electric telegraphy. Prompted by receiving news of his wife's death too late to attend her funeral, Morse was determined to improve the speed of long distance communications (which at that point relied on horse messengers). ^ Steven Roberts. "Distant Writing - Bain". ^ "David Edward Hughes". Clarkson University. April 14, 2007. Archived from the original on April 22, 2008. Retrieved September 29, 2010. ^ Hobbs, Alan G. "Five-unit codes". Retrieved May 1, 2012. ^ Foster, Maximilian (August 1901). "A Successful Printing Telegraph". The World's Work: A History of Our Time. Vol. II. pp. 1195–1199. Retrieved July 9, 2009. ^ "U.S. Patent 888,335 issued in May, 1908". Retrieved August 13, 2011. ^ "U.S. Patent 862,402". Retrieved August 13, 2011. ^ "U.S. Patent 1,286,351 filed in May, 1910, and issued in December, 1918". Retrieved August 13, 2011. ^ a b Colin Hempstead, William E. Worthington (2005). Encyclopedia of 20th Century Technology. p. 605. ^ "Morkum Printing Telegraph Page Printer". Retrieved August 15, 2011. ^ KLEINSCHMIDT, E. (April 14, 1916). "TELEGRAPH PRINTER". USPO. Retrieved July 11, 2008. ^ KLEINSCHMIDT, E. (May 1, 1919). "METHOD OF AND APPARATUS FOR OPERATING PRINTING TELEGRAPHS". USPO. Retrieved July 11, 2008. ^ a b Huurdeman, Anton A. (2003). The Worldwide History of Telecommunications. Wiley-IEEE. p. 302. ISBN 0-471-20505-2. ^ Deckert, Jürgen; Kösling, Heinz (1987). Fernschreibtechnik [Teletype Technology] (in German). Berlin: Militärverlag der Deutschen Demokratischen Republik (VEB). ISBN 3-327-00307-6. ^ "Flight Service History 1920-1998". ^ "FAA HISTORICAL CHRONOLOGY, 1926-1996" (PDF). ^ "Signaling system". March 29, 1944. Retrieved February 7, 2019. ^ "Introduction to RTTY" (PDF). ^ Baudot.net: Creed & Company, Ltd.
^ Colin Hempstead, William E. Worthington (2005). Encyclopedia of 20th-century technology. p. 605. ^ "Morkum Printing Telegraph Page Printer". Retrieved August 22, 2011. ^ "History of The Teletype Corporation". Archived from the original on June 3, 2008. Retrieved March 3, 2010. ^ Trademarks. "Search trademark database". ^ Adjustments, Type Bar Page Printer, (Model 15). Chicago: Teletype Corporation. 1941. Archived from the original (PDF) on December 5, 2010. ^ Mergenthaler Linotype Company (1951). The Linotype Handbook for Teletypesetter Operation. Dr. David M. MacMillan. digital reprint by www.CircuitousRoot.com. ^ Doug Kerr. "Teletypes in Typesetting". Glendale, Arizona, USA: Southwest Museum of Engineering, Communications and Computation. Retrieved April 25, 2017.